Every day your practice is different. Ok, you are no longer a beginner to this yoga thing. Or, maybe you are, but you struggle every day to continue pushing through every posture. The second you begin to struggle, you are forgetting the first step of every posture, which is normal breathing. Yes, this breathing rate might be faster, but you should never feel like you can’t breathe. 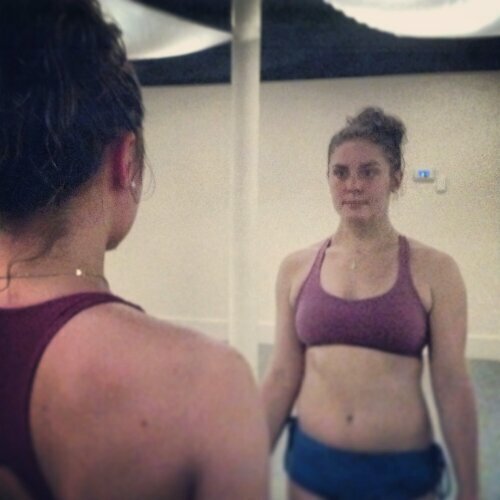 Sitting in Bikram Yoga can actually deepen your practice. Killing your “self” means to kill the ego telling you to have the best posture. Killing your “self” means you don’t care if you are the only one sitting. Your body needs the break today. Killing your “self” means accepting the body you brought today. You may be getting sick. You may not have drank enough water. You may have drunk too much wine the night before. Whatever the reason, listen to your body. Killing your “self” means you can look into your own eyes for 90 minutes. You spend the rest of your life trying to live up to the expectations and demands of others. Take the time in yoga to see what you need. Part of learning to kill the self is learning to focus only on yourself. This is not being present. There is so much going on within your own body that you are missing when you focus on anything other than yourself in the mirror. In fact, you may be struggling because of your lack of focus. Days when I am actually able to stay fully present I find that I work harder than I have ever worked, have a larger pool of sweat on my mat than normal, and yet I find I was able to keep my heart rate lower and a smile on my face. I am relaxed while also killing myself and my self! Next time you start to feel uncomfortable in class, don’t reach for water. Don’t wipe your sweat. Don’t look to your feet. Don’t make a face to friend asking if it’s hotter than normal. If fact, don’t even ask yourself that question. It doesn’t matter. What you should do instead is look to yourself for answers. Stare into your own eyes. Take a long slow inhale. Take a longer slower exhale. Give yourself a smile. It’s hard to have negative or anxious thoughts with a smile on your face. Repeat this process as much as you need. Some days you may have to take it to the floor from here, but still work to look into your own eyes. Part of the practice and part of the yoga is getting in touch and accepting yourself. Your body. Your thoughts. Your actions. Your Present. Today’s present and practice might be harder than yesterdays You don’t know what tomorrows will bring, but today you will get more out of your practice remaining calm.